Friday night saw the inaugural Beer for the Year pub crawl around Oxford. What better way, apart from a beer festival, to try a few different ales. The organisation of the pub crawl started three weeks ago with a Doodle poll to find a night that everybody could attend. I love Doodle. Doodle is a quick and easy way to set up a poll to organise a meeting or a night out when multiple people are involved. You create a poll, email the poll link to everyone and they fill out the days and times that are good for them. For the Beer for the Year Pub Crawl Doodle poll, Friday 15th February came out as the favourite night. The route was planned meticulously right down to the times we needed to be at each pub. Some would call me OCD for this, I would call it great planning. The timings were also there so that people knew where to join us if they were running late. I like to look after everyone. There was even a quiz for people to do with questions on each pub visited. Here is the route that we followed and the times we were supposed to be in each pub. This entry was posted in Uncategorized and tagged Beer, Lamb and Flag, London Pale Ale, Meantime Brewery, Pub Crawl, Saltaire, The Chequers, The Crown, The Kings Arms, The Royal Blenheim, The Turf Tavern, Triple Chocoholic. Conchi was first! what a fix. it was a good night and yes, a little OCD. Abingdon next? Yes, maybe Abingdon next. 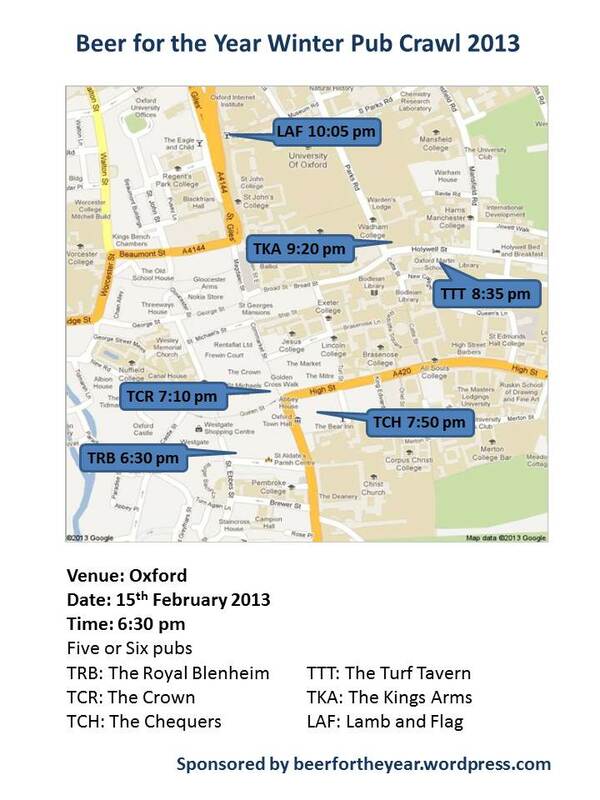 Or a replay in Oxford with a different route taking in different pubs! Some great pubs! I’m envious… 🙂 Been ages since I’ve been out drinking in Oxford. How about some English pub pictures for us in the US to see? Sounds like a fun night of beer drinking! It was a fun night of beer drinking, and I know that there will be more. I will see what I can do about taking some pictures the next time I go out.